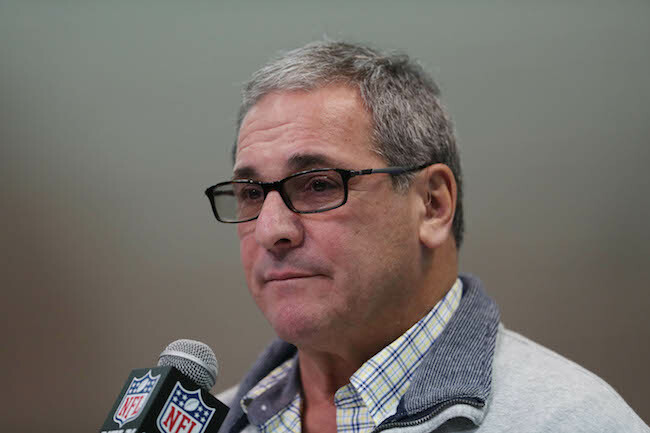 The New York Giants announced on Thursday that they have hired Dave Gettleman as the team’s general manager. Kevin Abrams had been serving as the Giants’ interim general manager since Jerry Reese was fired on December 4th. The 66-year old Gettleman was the Giants’ pro personnel director (1999-2011) and senior pro personnel analyst (2012) before becoming the general manager of the Carolina Panthers (2013-2017). The Panthers fired Gettleman in July 2017. The Giants only interviewed Gettleman and three other individuals for the position, including Giants’ Vice President of Player Evaluation Marc Ross, former Washington Redskins and Philadelphia Eagles Director of Pro Personnel Louis Riddick, and Abrams, who was the team’s assistant general manager before serving as interim GM. Gettleman was interviewed by team President/CEO John Mara, Chairman/Executive Vice President Steve Tisch, and former general manager Ernie Accorsi last Wednesday. Accorsi served as a consultant to Mara and Tisch during the selection process. Gettleman will be introduced to the media on Friday at an 11:15AM news conference at Quest Diagnostics Training Center. Wide receiver Sterling Shepard (neck), wide receiver Tavarres King (concussion), tight end Evan Engram (rib), and defensive end Jason Pierre-Paul (finger/back) did not practice on Thursday. Wide receiver Roger Lewis (ankle), offensive tackle Ereck Flowers (groin), offensive tackle Bobby Hart (ankle), and defensive end Avery Moss (hip) practiced on a limited basis. The New York Giants practice on Friday at 10:55AM. Interim Head Coach Steve Spagnuolo and select players will address the media after practice.